Set off westwards to catch the first lock after Castelnaudary as soon as it opened. The heavy rains yesterday have left the water levels very high; our ropes were straining against the bollards on the quayside and Neville almost damaged the wheelhouse at the entrance to the first lock, which is only two or three yards after a fairly tight bridge-hole. He was trying to line up for the lock and centre the boat for the bridge arch at the same time. No damage, but it certainly panicked the lock-keeper, a very pleasant and chatty woman. Yesterday we had taken the car and visited Agde, to have a look at the place where we have booked the boat in September, so that we can pressure wash the bottom and patch up any damage to the hull coating. We’ve heard good reports about this boatyard, and certainly the chandlery is one of the best stocked we’ve seen. Almost everything we’ve ever brought from England or Spain (impellers, water pumps, raw water intake filters) was available there. No space at Port Lauragaise (where we’ve been told they now have a Capitaine) so pushed on to Renneville and moored behind the big trip boat (Surcouf) that’s based there. Pity about Lauragaise, there’s an internet connection there. Some kind of power problem at the last two locks. 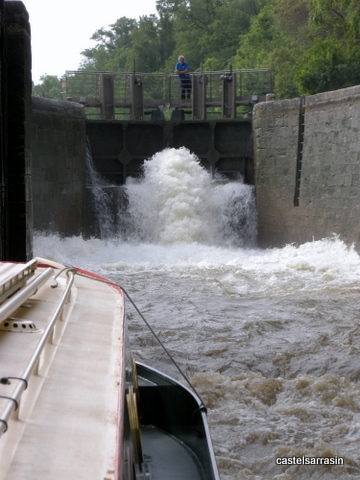 At the double lock, Encassan, the locks were only partly electrified, and the lockie had to wind the paddles. At the second, Renneville, the poor lockie had to wind both the gates and the paddles. As a result, each lockie only opened one of the four paddles, and progress was very slow. Both locks are under renovation, due to finish April. Arrived at Gardouche lock by 9.00am. Automation work not very advanced as yet, just the cables emerging from the ground. Again, the lock-keeper only opened two of the four paddles, so progress slow. It looks as though some of the old barges that used to be found on the approaches to Toulouse have now relocated to the easterly approaches to Gardouche. There would have been a space available on the quay had we pressed on yesterday afternoon, though Gardouche is normally very busy. Arrived at Negra at 10.30 am. A notice there says that you must ring 06 45 40 64 09 for the services of the lock-keeper who is servicing all the locks between Castanet and Negra. Luckily, he arrived fairly quickly. This is just a temporary measure whilst the locks are being automated, we hope. The next lock, a double (Sanglier) was manned, as was the converted double lock at Ayguesvives, where the lockie advised that from Montgiscard the locks would be automated, and handed us an instruction sheet. It’s the usual stuff, crew goes ahead to press the arrow for the direction in which you’re travelling, the lock prepares and opens, then press the green button when in the lock. Arrived Montgiscard lunchtime. Water levels low on the last stretch and lots of debris/branches in the water just before Montgiscard. Apart from two boats going in the opposite direction early on, we saw no other boats at all throughout the day. Moored just 50 yards away from the lock. A great start from Montgiscard. Trapped at the bottom of the first lock when the doors wouldn’t open after it had emptied. Helpfully, the leaflet given to us at Ayguesvives had no number for you to call, simply advising you to press the button on the control panel, four metres above your head. A slimy ladder hike was in prospect until I noticed an elderly man on the bridge and managed to ask him to press the button on the control panel to speak to the lockie, wherever he was. We wasted 45 minutes in this lock waiting for someone to arrive. So much for automation. The second automated lock (Vic) had only two paddles working to fill the lock, and three to empty. Progress very slow this morning. Arrived Toulouse after lunch, after cruising a considerable distance alongside the larger live-aboards which line this bank, of varying vintage and condition. A variety of dogs can be found on these residents, and we passed at close proximity to several bad tempered Rotties and a few more placid Laboradors. We saw an unusual bird perched one one boat, both on our downstream and upstream journeys, which we took to be a baby heron, though someone later told us that it was quite a different species. Anyone in the know can post at the end of this blog, if they want to. Quite a few familiar boats in the port at Toulouse, Liza, Sea Wolf, Matilda, Carmen, Angelique (though Peter and Jill not yet arrived from South Africa) and Julie B (also from South Africa) who we’ve come across several times since Carcassonne. Ailsa, another newer Sagar boat was also there – had a quick drink with them. The first lock west out of Toulouse has ground bollards, floating bollards and sliding pole. The canal was full of debris. Again the first lock of the day stuck with the doors only just cracked open and we were left for five minutes in the bottom of this deep lock until they finally opened. Toulouse - apartment with 'garden'. 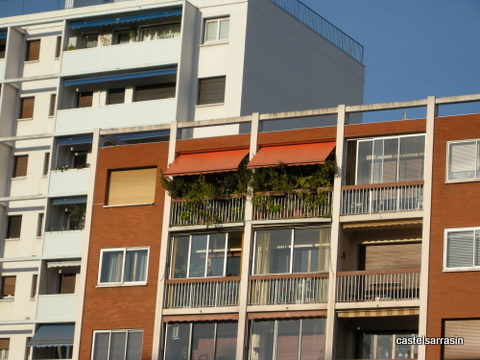 As we passed through the city we saw the usual ‘clochards’ sleeping on mattresses or in sleeping bags beneath the bridges, and the usual apartment blocks lining the route, many of them with virtual forests growing out of their balconies, palms, conifers, all sorts of trees. Less picturesque are the rat poison boxes every 50 metres or so along the banks of the canal. An incongruous sight here; a gull swooped down over the canal, collected quite a large fish, soared up above the busy early morning traffic…. and dropped it. He continued to circle as cars rushed by, no doubt squashing his booty. The second lock has bollards, sliding pole and alcove mounted bollards closer to downstream gates. Third lock just bollards, and here one of the gates wouldn’t open when the lock had emptied. Time wasted at the bottom of the lock – another 30 minutes while a technician was sent for. It simply doesn’t pay to be the first one at the locks, it seems. 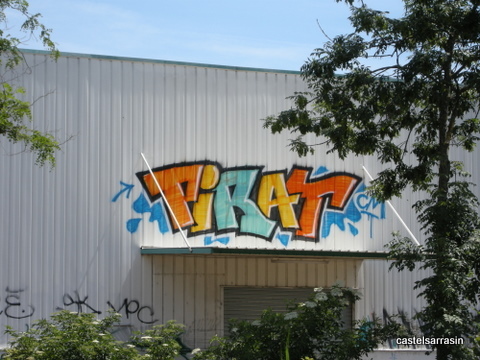 After we joined the Garonne we passed through the industrial estate, admiring (if that’s the right word) the graffiti which adorns the factory units there. The next nine locks went without incident. This is a pretty uninteresting stretch, with industrial units on one side next to a high speed railway line, and fields on the other. At one of the locks the sliding pole had been taken out, but the nuts and bolts which had secured the base plate were left, each standing at least an inch proud of the ground. Flicking the rope off from the bottom of the lock, I managed to get it trapped under every one of the nuts, one after another. Moored for the night at Dieupentale, where a new quay has been built just west of the bridge. A long day – 34 kilometres and 11 locks. Most were automated, but the Montech locks were still managed by lockies. 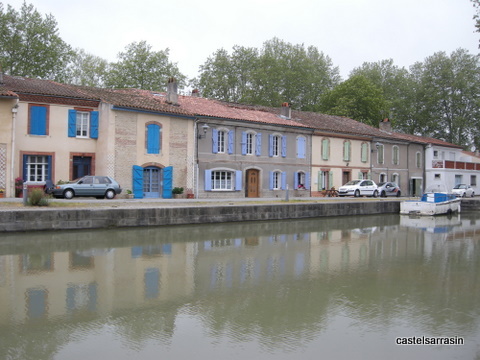 We planned to stop at Castelsarrasin, but there was no space, so after picking up bread we continued on to Moissac. We have heard that the locks are closed Sunday 1st May, and there is talk of a strike on the following day. We decided we would take a break at this point, and drive down to Spain for a few days. On our return we’ll decide whether to continue west for a while, or to turn round and retrace our steps. We had to return to Castelnaudary to pick up the car which was garaged there. Walked to the station which is on the outskirts of Moissac, in hot and sultry weather. There was the inevitable queue inside the station building, and although we had allowed plenty of time for ticket buying (after our experience at Castelsarrasin last year), we still found we were on the very last minute by the time we purchased our tickets. There isn’t a ticket machine at Moissac, as there wasn’t at Castelsarrasin, so you do need to arrive early. So, off to Spain early next morning. We arrived back from Spain on Saturday, and spent a few days in Moissac. Ian and Gill (Jazz) had arrived back at their boat and were moored next to us. We hadn’t seen them since last September when we were at Meilhan, so we met up for a drink or two and to exchange news. 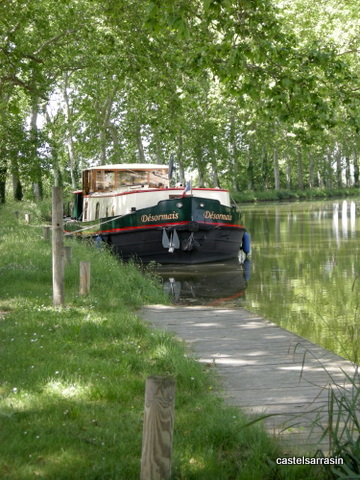 We decided to turn round and head back towards Castelnaudary to find safe moorings for the summer months, and from there back to England. We’ll have been away around nine weeks by the time we get back. The time has flown by. Steady pace all day with no mishaps, making it from Moissac to Dieupentale by 5.00pm. No other boats on the water! The only one we saw was after we’d moored up, and he went past us like a bat out of hell. An expensive private boat. One of my least favourite stretches today – from Dieupentale climbing up to Toulouse. One or two locks with strong flows, particularly No 5, which is the place where the pitching of the boat gnawed our rope in two a couple of years ago. And then the deep locks in the centre of Toulouse, the last one of which is very dark and depressing. As you rise up in the lock Matabieu station is on your left, quite a magnificent building. All passed without incident, no problems with any of the locks either, which is unusual for this stretch where we have been stuck on several occasions. It was extremely hot, and not a breath of wind. The pollen count was high too, dusting the surface of the water. We crossed with only two other boats along the entire stretch. The approaches to Toulouse are the same as ever, the buildings on the outskirts sporting quite skilful graffiti, the canal full of debris, passing under stinking bridges, and the usual ‘clochards’ drying out their bedding on railings on the canal bank. The distinctive and unpleasant smells of Toulouse mingle with the fragrance of the shrubs lining either side of the canal – a weird mixture. Arriving at Port Sainte Savieur in the centre of Toulouse, we found Peter and Jill Lawson had arrived from Cape Town to spend their customary four or five months on Angelique. Peter was responsible for starting the Can2Mers discussion forum on the internet, and we had a drink or two before dinner, exchanging waterway news and discussing the situation in South Africa, where we lived for a while in the nineties. Still unbearably hot, until the sun eventually sank behind the apartment blocks bordering the river. Off well before eight am, quick trip to the boulangerie on the quay, saying goodbye to Jill and Peter who were already up and about. These newly automated locks upstream of Toulouse are very, very slow now. Only three paddles are being raised, and then only slowly. We made Ayguesvives by lunchtime and just below Renneville by the time we called it a day around 5.30pm. After negotiating the double lock at Sanglier (which was manned) we arrived at Negra to find the deep lock there still unemptied, and the lockie who had taken us through Sanglier standing chatting to three of his VNF mates. This automisation has certainly been a godsend! For them. Negra took almost 15 minutes to fill, which together with the fact that there is no downstream landing stage to put the crew off, makes it just about our least favourite lock along this stretch. Gardouche was still not automated and there was no cabling in place for the control box yet. Not enough space on the quay for us due to an old rusting barge undergoing renovation, plus a cruiser. Moored below Renneville behind Surcouf, the trip boat, as we usually do. Not as hot today, a bit more cloud about. Renneville lock is not yet automated, but the lockie estimated it would be completed by the end of May. Other single locks along this stretch are at some stage of being automated but as yet are still manned. When we reached the double lock at Encassans the lock keeper opened both lock chambers at the same time. He’s done this on previous occasions and we’re always surprised that this doesn’t happen more with the doubles along this stretch. It certainly saves a lot of time passing ropes etc. We reached the summit mid morning, having made good progress since nine o’clock. Somehow we always manage to time it that as we negotiate the Ocean lock, there’s a huge group of hikers passing through, and once again our locking provided an entertaining spectacle for the group, the lock-keeper posing proudly between our boat and the control panel. I asked the lock-keeper if this lock was to be automated, as it seems a key lock for the distribution of water along the system. I think he confirmed that it would be automated, but that there would always be a presence there for water management purposes. It was very quiet at Le Segala, with hardly any boats along the quay. I remember a time when it was practically impossible to moor along here. The restaurant here has a big sign boasting ‘under new management’. We got through the double lock just on 12.30 and moored up at the triple lock at Laurens for lunch. At 1.30, no lockie in sight. By 13.50, having tried unsuccessfully to raise anyone at the lock-side building, we decided to ring another lock to see if they could do something but they just told us to ring back in ten minutes. The lockie arrived five minutes later, hung his wet swimming trunks out of the window to dry, and then got on with the business he gets paid for. He’d clearly assumed that it would take a good twenty minutes for someone to get down from the preceding lock, and hadn’t been told that we had just got through dead on lunchtime. We reached Castelnaudary by mid afternoon and moored up in the port, which seemed a lot busier than the last time we passed through. The hot and humid afternoon gave way to stormy clouds, and by six o’clock, after some thunder and lightning, it started to rain. During the evening the solitary swan who cruises the waters either side of the port area came up to the boat for some bread. We’d been told that when it lost its mate the townspeople arranged to have another one brought in for it, but they didn’t take to each other and the newcomer died in the ensuing battle. Now it strikes a sad and solitary figure wandering up and down the waterway, getting very bad tempered at passers-by. I noticed it seemed to be holding one of its feet up on his back, and was plucking viciously at the top of his leg. Maybe it’s been injured, but fond as I am of birds and animals, I won’t be the one to investigate. 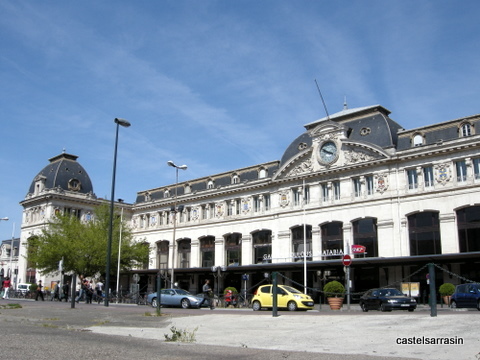 Tomorrow we will catch the train to Moissac and bring the car back. This will involve a trip to Agen, to pick up a connection that will bring us back to Moissac. But travelling by train in France is a pleasant enough experience, and by and large the service is quite efficient, even if the ticket buying process is inexorably slow. And that, now, marks the end of our spring cruise for this year. We will take a few days rest, clean up the boat, do a few jobs and then will moor it up on the other side of the port for the summer months. Odile has told us that by the week commencing 22nd August all boats must be out of the port in Castelnaudary, as there is a week long Fête du Cassoulet during which time a whole host of water sports will take place in the port. Passing traffic may not be able to get through so easily and may have to wait for a convenient moment in the festivities, which will no doubt cause something of a log-jam at the four locks after the basin. She also advised not to leave your boat moored below the bridge (especially if you were not on board during that period), as last year there were a lot of incidents with people climbing on boats, and some bicycles were stolen from the boats. 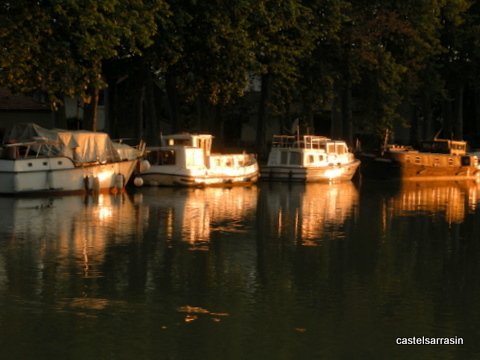 Chris and Val (Liza) were moored up at Castelnaudary and we had drinks together. We’ve been in the same port on so many occasions, and we have several mutual friends, so it was good to make their acquaintance after all this time. Moved the boat over to the other bank of the port, where we won’t have to pay mooring fees during our absence. There was just enough space between two moored boats for us to fit in. We are in the shade, but no doubt will return to find our boat covered in sap from the plane trees above us. But that’s a problem for another day. Went into the town for a final haircut, having managed to strike up an understanding with ‘le maitre‘ at the Star Coiffeur over the last seven months or so. I’d visited the shop last week to try to make an appointment, specifying it must be with ‘le monsieur’ or ‘le maitre’. Turned up to find he’s been off sick for weeks after having a hernia operation, and the dialogue I had with the staff last week led them to believe that I was making an appointment for my husband as well. They kept asking me if ‘le monsieur‘ was coming, and I kept wondering why they thought I would know. Eventually the penny dropped for all of us, one hairdresser having enlisted the help of the other girl to speak to me in French! The other hairdresser’s contribution was to say the same thing, only louder. Later we called at the SFR shop in the town where Caroline, a helpful French girl who speaks extremely good English was able to suspend our internet contract for the greater part of our absence. This will of course extend the period of the contract beyond its original term, but we are more than happy with our current set-up. It’s a small routing device which receives the signal and enables us both to be on the internet at the same time. It’s worked very well, even out in the sticks though on some occasions when we are miles from civilisation the download speed drops from 3G to 2G, which doesn’t matter so much for email but is a bit slow for the internet. You can only suspend it for periods relating to the monthly anniversary date, but that’s no big problem. Back on the boat, our water pump, which had been making a funny noise for a week or so, stopped working this morning. We discovered it had tripped the isolator. Having reset it, we managed to get a little water through before it did it again. Great! For our last day we are having to do some serious water conservation. We will bring another pump out with us on our return journey. So that’s it for now. We will be back mid August ready to start the final leg of our journey towards Agde where we will take Désormais out of the water to clean and check the hull and then continue on towards the Rhone and central France. 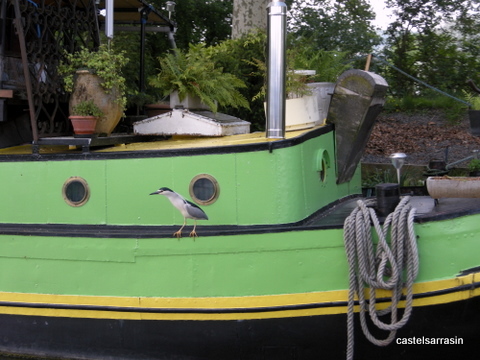 This entry was posted in Cruising in France and tagged Ayguesvives lock, Castanet lock, Desormais, Dieupentale, Fete du Cassoulet, Gardouche, Le Segala, Matabieu station, Moissac, Montgiscard lock, Negra lock, Port Lauragaise, Renneville, Surcouf, Toulouse, Toulouse locks. Bookmark the permalink.